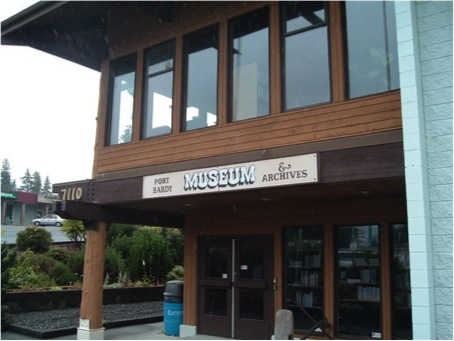 Located on the Market Street entrance, the Port Hardy Museum & Archives is operated by the non-profit Port Hardy Heritage Society. It is open year-round and admission is by donation. The Museum exhibits aboriginal artifacts, early settler’s effects, natural history materials, and local industrial equipment. Newspapers, maps, school records, photographs, personal histories, and institutional records are preserved in the archives. Aboriginal art and jewellery, local crafts, postcards and souvenirs are available in the Museum Gift Shop. Call ahead for hours of operation 250-949-8143. The Community Collections Committee is looking for new members. They help the curator decide which donations to accept for the permanent collection. If you are willing to commit to three or four meetings a year for a maximum of two years, please let us know. Are you interested in family history and/or genealogy? If so, call or stop by the museum and talk to curator Jane Hutton about the Genealogy Club.